Enjoy this beautiful, extra large 1 bedroom, 2 bath tropically furnished condominium, with a wide lanai overlooking the blue Pacific Ocean. Situated on the third floor of a quality landscaped complex within walking distance of Kailua Village, swimming beaches, and all the amenities. A generous pool, sumptuous cabana and fully equipped barbecue area are great for relaxing or entertaining. Palms shade the lanai, and breeze from the overhead fans keeps things very comfortable inside, but air-conditioning is still available if needed. The living room serves as main gathering area with plenty of seating, an entertainment center and a dining table. Our full kitchen comes with all the usual appliances and gadgets, and is usually stocked with most of the basics. For comfort, we have two full, separate baths, one with Jacuzzi tub. For sleeping, we have one king size and one twin size beds in the master bedroom, a foldout futon in the living room, a twin size bed and a foldout futon on the lanai, and two foldaway beds in the closet. I am a semi-retired civil engineer who is active in Rotary. This photo was taken of me at the head of the Nile River in Uganda while volunteering for a humanitarian project. While working in Kona years ago, the company rented several units for our engineers and inspectors to stay in while working on a large project. I got to know the complex very well and fell in love with the atmosphere. My wife and I love to bring our children over from Hilo to Kona when possible to relax at the condo. We especially enjoy grilling fresh fish and veggies while enjoying a glass of wine between splashes in the pool. Recently remodeled. New cabinets, granite counter tops, and appliances. We have done several returns to KP. A very nice, clean, quiet, well kept condo. We will return again. We have an earlier review from a previous visit - ibid to what we wrote before. We had a very enjoyable stay for 10 nights Nov 30 thru Dec 10 2018, wished we could have stayed longer. My brother stayed here in March of 2014 so we were familiar with the unit as we had visited with him at that time and thought it would be a good choice for us as well. He was very complimentary of our host, Peter. We too found Peter to be available and very helpful. The unit was stocked with the basics. including cleaning supplies and the laundry soap! Having an assigned covered parking space is also a big plus. We had a peaceful stay within a short walking distance to our favorite Happy Hour location and the shops in Kona. Know that my brother will definitely check if this place is available for his next stay in Kona, and so will we. Thank you Peter for being so accommodating! Good location. Nice and quiet. This was our first time staying in a condo in Kona. The condo was just the right size for myself and my husband. We had all the comforts of home. It was easy to walk into the town of Kona for restaurants, nightlife, etc. It is located centrally so it's easy to drive to grocery stores. It was a nice first experience. Thank you. While it may not be the flashest new condo in Kailua, it has everything you need for a comfortable stay while enjoying all that Kailua-Kona has to offer. The owner is readily available to address any issues and the condo complex is quite quiet when compared to others. Walking distance to everything in town is quite convenient. Aloha, We enjoyed our stay at Kona Pacific. The condo is walking distance to many shops and restaurants - Don the Beachcomber, where mai tai was invented is just across the street. The building and grounds are well kept. The complex is very quiet, you seldom hear your neighbors and even though the condo is located near two busy streets, street noise is not heard - it is very quiet. 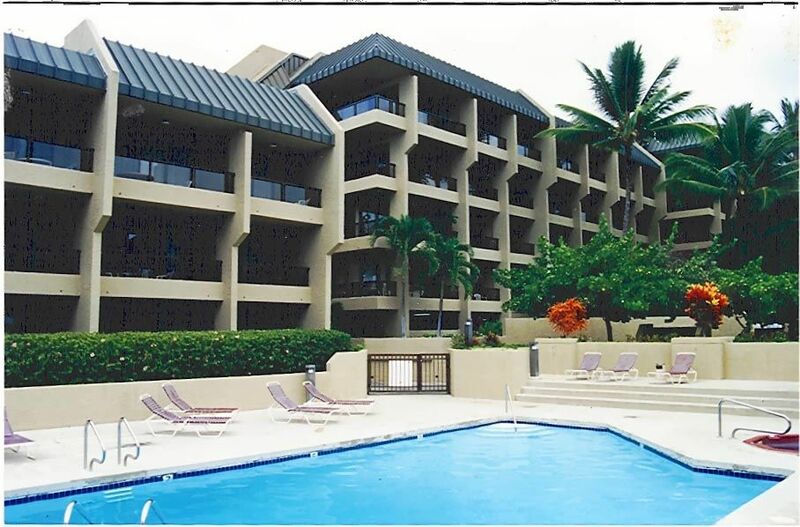 Peter's condo is a large, comfortable place with many amenities and beach toys that will enhance your Big Island stay. All necessary cooking utensils are available and there are two Weber grills on the upper pool deck with a third grill located at the far end of the pool. If you don't feel like cooking, there are at least 8 to 10 restaurants within a 15 minute walk (some as close as across the street). Peter's condo also comes with underground, off street parking, you will appreciate that on a mid 80's day with a high Hawaiian sun. We are annual visitors to Big Island and are looking forward to our next stay at Kona Pacific and certainly at Pita's place if the dates work out. Aloha & mahalo, Papa & Grandma L.
Very good location and very helpful owner. Had trouble with the tv and Peter took care of the problem quickly. Hawaii, the Big Island, is an island still being created before your very eyes as volcanos bubble and spew forth red-hot lava into the sea. Here, 11 of the 13 climates of the world can be found. Scenery changes here every few miles from lush rain forests, to barren black lava fields, to snow capped peaks. Nestled at the bottom of the Hualalai Volcano, is the village of Kailua-Kona. This charming town mixes numerous historical sites with modern tourist attractions. Restaurants, shops, and hotels abound. Sunsets viewed from the seawall are almost always spectacular. Discounts available for kamaaina, return guests, and last minute openings.